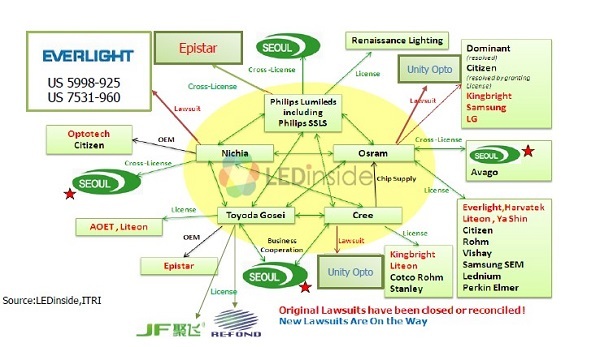 Wars in the space of LED lighting technology patent never end and are even growing in numbers in the post oligopoly era (see more details about the shift here). LEDinside did a series of quick Q&As with Tim Lester, CEO of Bridgelux. The CEO articulated his views on the transition of patent landscape and strong confidence to withstand competitions from rivals. Q: What are Bridgelux’s strengths in the LED patent market? A: Bridgelux has invested heavily in research and product development of core LED technologies used throughout the solid state lighting industry across die, surface mount, array and modular systems. These core technologies are the intellectual property of Bridgelux and protected through Bridgelux’s strong patent portfolio. Bridgelux was the first LED company in the market to be solely focused on general lighting and quality of light, and the first to introduce COBs in 2009. Bridgelux’s patent portfolio is deep and fundamental to the industry. Q: Everlight filed a lawsuit against Bridgelux in June and the litigation is still under way. How does Bridgelux consider this legal action? A: Bridgelux believes that Everlight’s claims are entirely without merit, and this lawsuit is the result of the success of the Bridgelux 2835 SMD products in the market. Bridgelux will vigorously defend itself against these claims. Q: A recent update said Nichia’s white LED patent just expired. More major patents are said to be licensed in the future. How does Bridgelux see it? A: The IP landscape will be increasingly focused on issues related to quality of light rather than simply the extraction of light as we’ve seen in the past. There are two trends that we’re seeing. First, many fundamental LED patents that were about pure semiconductor processes are aging and reaching their lifetime. Second, there is a market trend not just to control light, but also for the ability to render high quality light, which is valuable for end customers. Therefore, there will be an increasing amount of companies licensing and cross-licensing technology to accomplish more sophisticated application requirements. With over 1,000 patents owned or licensed with major players in the LED industry, Bridgelux prides itself on respecting the intellectual property process and the intellectual property of others. We already have several cross licenses in place with other prestigious global companies. Q: As the patent war heats up, lawsuits like such case will be more in the future. How will Bridgelux prepare for it? A: We are customer focused and respect the intellectual property process and the intellectual property of others. We will continue to innovate and use our proprietary intellectual property to provide solutions to our customers. We prefer to focus our attention on product innovation and customers, rather than competitors. Yet, if we are attacked, we will defend ourselves using all tools at our disposal.